"One of the best things about being a Guardian Angel is you find out you care about something." An engaging speaker is addressing a room full of people wearing red berets. Hailing from Baltimore City and Washington DC, some of the audience members are old Guardian Angel pros and some are recent volunteers, but everyone's attention is on the man who is speaking. One of the best things about being a Guardian Angel is you find out you care about something. "When you're a Guardian Angel, you come across all types of people, often during the worst time of their lives: rapes, muggings, shootings, you name it. All types of people and every type of situation. But you learn how to comfort them, you learn how to say it's going to be ok. Being an Angel makes you a better person, it opens you up to new ideas. When you talk with people about their problems, you'll gain a greater awareness about the local communities and the high crime areas. And the more we know, the better we can help, and the better a community will respond." Looking at the speaker, you may never guess he's nearing 44 years of age. But listening to him, it's easy to tell he has years of experience to draw upon. His face is kind and his smile is contagious, but there's a determination in his voice that lets you know not to underestimate him. 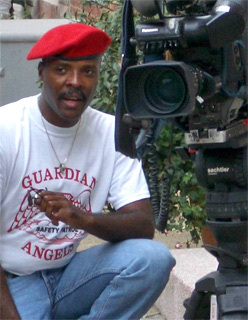 His name is Marcus "Strider" Dent, and he's the Commander of the Baltimore Chapter of the Guardian Angels. Growing up with his Mom, Grandma, two brothers, and three sisters, Marcus Dent lived most of his life in Baltimore City and Baltimore County. Like many young boys, he enjoyed playing football and baseball with the other neighborhood kids. He tried his hand at boxing, but eventually focused on martial arts: it didn't hurt as much, and it started teaching him self-confidence and discipline. Like many families in Baltimore City, they had their fair share of troubles and worries. And Marcus's family would move around a bit over the years, always searching for a better and safer place for the kids to grow up. Undoubtedly the moves helped shape him into who he is today: a man who can easily relate to many different people from a variety of backgrounds. Ask any of the Guardian Angels how people see Marcus and many of them will reply with descriptions such as "inspiring," "committed," and "full of hope." Expanding a bit more on those thoughts, one Guardian Angel added, "I think no matter what, people see Marcus as a leader and as a fair person. He treats everyone the same: from the person who cleans the building to the person who owns the building. He remembers everyone's name and he looks everyone in the eye. He expects the same from everyone: from the individual, to the community, to the businesses, to the government." His Guardian Angels call sign is "Strider" and the name was given to him by his wife. "She tells me I'm always trying to downplay everything I do, that I don't talk about those things, that I try to stay in the background. But she also thinks I have an ability to lead. I'm not sure if I agree with her or not, but I am confident in my team. We have people from all walks of life, with a range of life experiences. We have people who know what it's like to face the challenges these communities face today and who understand the hard choices people have to make. I think we have a real chance at making a difference, at reaching out to the kids being recruited into the gangs and selling drugs. Many of us have been exactly where they are now, we know how hard it is, and we know what's at stake." Marcus himself gained a lot of insight into the problems communities in the Baltimore area face not only as a resident, but as a member of the Guardian Angels during their first incarnation in the city back in the 1980s and 1990s. "I first learned about the Guardian Angels from a television show, it was a one-time thing called We're Fighting Back. I remember thinking the Angels seemed like superheroes, like community soldiers. When they started the Baltimore chapter a few years later in 1981, I wanted to be a part of it. I went and watched them train in War Memorial Plaza in front of everyone, and I signed up. I was 18 and I thought it looked cool. We have people who know what it's like to face the challenges these communities face today and who understand the hard choices people have to make. "It was cool and exciting and I learned a lot. But as time went on, I started meeting more and more people who had been robbed or mugged, people who were scared to step outside on their own front porch, and I started working with the kids in the neighborhoods. The flash of being an Angel only lasts so long. Eventually it starts becoming more than that. You become more dedicated to helping people and that passion is fed because you're surrounded by like-minded people who want to make a difference." The Guardian Angels' presence in Baltimore the first time around was short-lived. In 1991, after increasing tension with the police and politicians, the chapter closed. 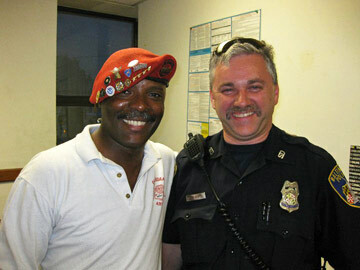 The city would be without the citizens in red berets for the next 15 years. Over the next decade and a half, Marcus continued serving the public. He worked with a variety of organizations, including Baltimore County Schools, on community service projects. He served as Director of the Tao Chuan Po Kung Fu School in Essex where he worked with at-risk kids. And although his title was Director, any given work day he could be described as a teacher, a friend, and a role model. Teaching the kids martial arts, he helped them gain a level of confidence which allowed them to listen, to lead, to perform, and to make better choices. You become more dedicated to helping people and that passion is fed because you're surrounded by like-minded people who want to make a difference. But he never forgot his time with the Guardian Angels. And when he saw a newspaper article about the organization opening a new chapter in Cape Town, South Africa, he renewed contact with the Guardian Angels' founder, Curtis Sliwa. "Marcus had visited some family members in Cape Town earlier that year, and he knew the Guardian Angels' presence was needed there," commented a team member from today's Baltimore Chapter. "So he wrote up an email basically saying, 'Hey, I know you may not remember me from Baltimore in the 80's, but I'm really happy you're in Cape Town now' and he sent it to Curtis." As it turned out, Curtis did remember Marcus and the two began exchanging phone calls periodically over the next year. Little did he know at the time, but these phone calls would end up changing his life. 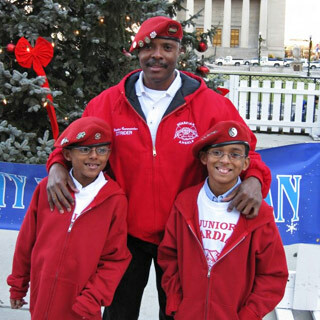 Although the Guardian Angels were opening successful chapters within the United States and worldwide, their absence in Baltimore was beginning to be noticed. And in 2005, a citizen concerned about the increase in crime in the area contacted Curtis Sliwa about the possibility for the Angels' return to Charm City. Curtis, in turn, contacted Marcus. "When Curtis contacted me about opening a new chapter in Baltimore, I didn't know what to think. The first time the Angels were in Baltimore we didn't have a good relationship with the police or the politicians. We had a core group of martial artists who were focused on soldiering, and the main thing we did was patrols. We'd walk from one end of the city to the other. We didn't really take a lot of time to get to know the people in the community. So we'd patrol, but we didn't communicate. I thought it was a problem. "I knew if we were bringing the Angels back to Baltimore City, it had to be done differently. It had to be done better. So I went up to Philly to see their chapter, and I saw how much the Angels have changed since I was involved the first time around. Now there's more focus on the community, and getting everyone involved in the process. And I started to realize that I could do this, that we could really do it right this time." It would take several months and many exploratory meetings with community leaders, churches, schools, police departments, and government officials, but soon enough Marcus found himself at the forefront of the new and vastly improved Baltimore Chapter of the Guardian Angels. "One of the main differences between the old chapter and the new chapter is our focus on working side by side with the communities. We walk with them, not for them now. We're meeting everyone: the community groups, the churches, the business owners. We're getting to know the pastors, the teachers, the kids, and the police officers. And we're doing a lot of listening. "Another difference is our relationship with local police and politicians. It's like night and day between then and now. Today we're working hard at keeping the lines of communication open, and we've received nothing but positive feedback and support from them. And the police departments are doing excellent work. Sometimes people say they aren't doing enough, but if you go to the monthly police meetings, you'll see they're involved. They know the residents, they'll address problems and acknowledge people by name. They're so in tune with what's going on. And it's important we work with them. We aren't here to replace the police. We're here to help empower the communities, and to help motivate people to come together to make a positive difference." 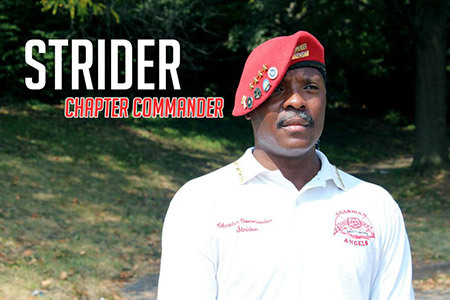 Sitting at a table in a room filled with red berets, it's easy to believe that Marcus "Strider" Dent and his team of volunteers will make a difference in the communities of Baltimore City. "The hardest part is going to be reaching the kids, diffusing the gang growth. That's the main thing. We can patrol and do whatever, but to change the mindset of the drug dealers, the runners, the kids being recruited into the gangs, that's the hard part. We'll be able to knock down a lot of those walls working with the churches, the schools, and the community. We can knock down those walls. But we have to build a positive path for the kids to follow. It's not going to happen overnight, but we can do it. "Our team can help pull communities together to let them see what we already have and what we still need. Then we go from there. And as Guardian Angels, we always do what we can, where we can to give back. When we get involved and involve the community, the crime rate is going to drop. Drugs, gangs, shootings. It's going to drop. And we're here to help communities make that happen."